Display is 12 Nixie types tubes. Semiconductors - Fairchild SL-35021, SL-35022, SL-35023, SL-35024, SL-35025 date coded to the beginning of 1971, & other ICs on 2 boards. 338 x 137 x 78 mm.h (13.3" x 5.4" x 3.1"). Similar electronics to the Casio 121K but a completely different looking calculator. 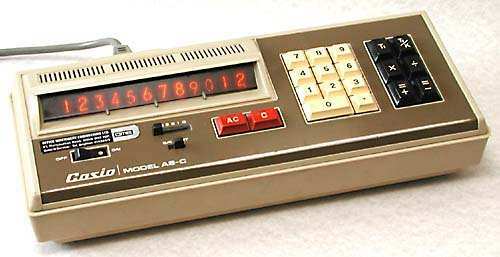 Casio were the first to produce calcutors of this design with the display at the side of the keyboard. This was one of a series of similar looking designs but with gradually advancing electronics. Some were produced for Commodore and Remington. The cost in the UK in April 1972 was £155 Sterling (about US$390). Casio have always been at the forefront of the development of electronic calculators. Fairchild, one of the giants of the semiconductor world at this time, were only briefly involved with calculator integrated circuits. The 4 large ICs among a scattering of small ones illustrates the growing takeover of the electronic functions by Large Scale Integrated-Circuits (LSI) at this time. Inside showing the display tubes and the top, display driver, circuit board. The other board is underneath, connected by jumper wires on the right edge. 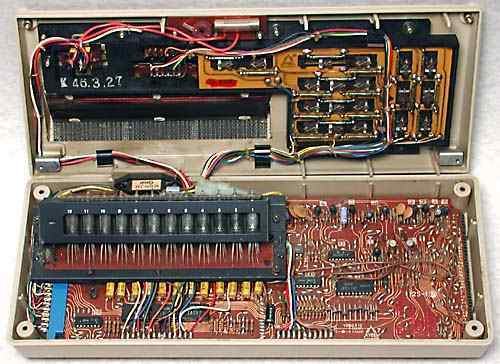 The bottom, calculator logic, circuit board folded out showing the four Fairchild large-scale integrated circuits. The underside of the keyboard. Next to each key is a glass capsule containing a reed relay. 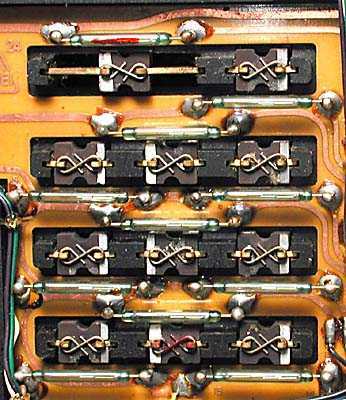 Each key has a magnet attached by wire, and when the key is pressed the magent is moved close to the reed relay and the electrical contacts close. This type of keyswitch was used in many early calculators and are ultra-reliable but expensive.